Man in his 40s, 18-year-old youth murdered, third victim moderately wounded; Arab terrorists shot at cars near Otniel, in Hevron Hills. 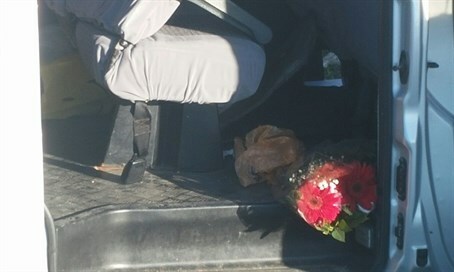 Two Israelis have been killed after Arab terrorists opened fire on their vehicle near the Jewish town of Otniel in Judea's Hevron Hills region. Four children who were traveling in the car were treated for shock at the scene, and evacuated to Soroka hospital in Be'er Sheva. "When we arrived at the scene we saw seven people outside the car; two of them - a man around 40 years old and a young man aged 18 lying unresponsive (on the ground) with gunshot wounds to their upper bodies. They had no signs of life and we declared their death at the scene. "We also provided first aid treatment and evacuated to hospital a 16-year-old boy, with gunshot wounds to his limbs, and four trauma victims."